PH: pulmonary hypertension; 6MWD: 6-min walk distance; WHO: World Health Organization; FC: functional class; LTOT: long-term oxygen therapy. RCT: randomised controlled trial; PH: pulmonary hypertension; RV: right ventricle; RVEF: right ventricular ejection fraction; MRI: magnetic resonance imaging; iPSC: induced pluripotent stem cell; LV: left ventricle; mPAP: mean pulmonary arterial pressure; PAOP: pulmonary artery occlusion pressure; PVR: pulmonary vascular resistance; RHC: right heart catheterisation; 6MWD: 6-min walk distance; NT-proBNP: N-terminal pro-brain natriuretic peptide; CPET: cardiopulmonary exercise testing; NYHA: New York Heart Association; FC: functional class; LDH: lactate dehydrogenase; FDG: 18F-2-fluoro-2-deoxy-d-glucose; PET: positron emission tomography; Nrf2: nuclear factor erythroid 2-related factor 2; ILD: interstitial lung disease; AMPK: AMP-activated protein kinase; PA: pulmonary artery. CTD: connective tissue disease; ILD: interstitial lung disease; POPH: portopulmonary hypertension; FC: functional class; V′O2: oxygen uptake; V′E/V′CO2: ventilatory response (minute ventilation/carbon dioxide production); CPET: cardiopulmonary exercise testing; hs-CRP: high-sensitivity C-reactive protein; NT-proBNP: N-terminal pro-brain natriuretic peptide; IL-6: interleukin-6; MLHFQ: Minnesota Living with Heart Failure Questionnaire; SLE: systemic lupus erythematosus; RA: rheumatoid arthritis; MCTD: mixed connective tissue disease; PVR: pulmonary vascular resistance; RHC: right heart catheterisation; 6MWD: 6-min walk distance; WHO: World Health Organization; QoL: quality of life; RCT: randomised controlled trial; TTCW: time to clinical worsening. Acetazolamide NCT02755298 Double-blind crossover RCT versus placebo: phase 2 and 3 5 weeks Stable patients with pre-capillary PH who are undergoing RHC for a clinical indication Change in 6MWD Change in QoL (MLHFQ), maximal ramp CPET, cerebral and muscle tissue oxygenation, daily activity (actigraphy), echocardiography parameters, FC, PRO (SF-36, CAMPHOR), NT-proBNP, etc. 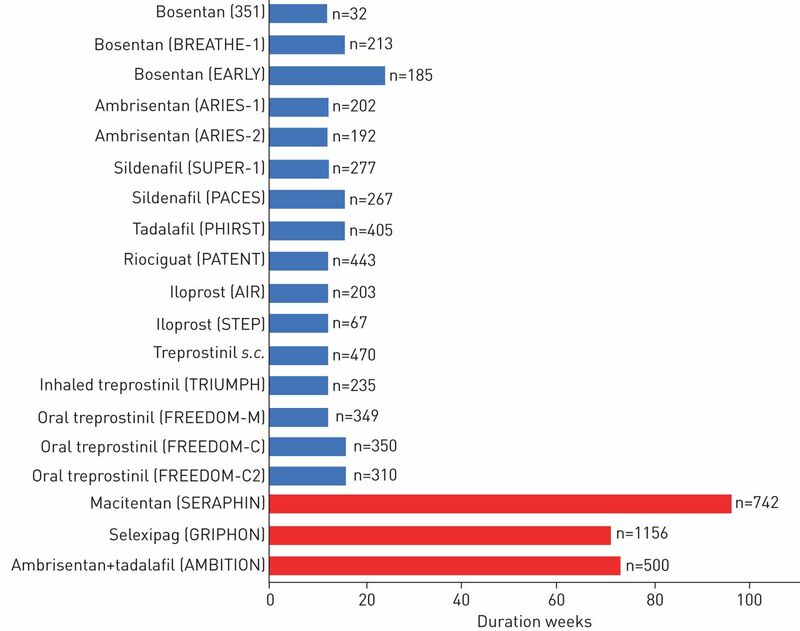 RCT: randomised controlled trial; PAH: pulmonary arterial hypertension; WHO: World Health Organization; FC: functional class; 6MWD: 6-min walk distance; RVEF: right ventricular ejection fraction; NT-proBNP: N-terminal pro-brain natriuretic peptide; SF-36: Short Form-36; emPHasis-10: 10-question survey proposed by the Pulmonary Hypertension Association UK; TTCW: time to clinical worsening; TAPSE: tricuspid annular plane systolic excursion; PH: pulmonary hypertension; RHC: right heart catheterisation; QoL: quality of life; MLHFQ: Minnesota Living with Heart Failure Questionnaire; CPET: cardiopulmonary exercise testing; PRO: patient-reported outcome; CAMPHOR: Cambridge Pulmonary Hypertension Outcome Review. PAH: pulmonary arterial hypertension; WHO: World Health Organization; FC: functional class; PGI2: prostacyclin I2; AE: adverse event; mPAP: mean pulmonary arterial pressure; PVR: pulmonary vascular resistance; 6MWD: 6-min walk distance; QoL: quality of life; NT-proBNP: N-terminal pro-brain natriuretic peptide; RV: right ventricle; MRI: magnetic resonance imaging; RCT: randomised controlled trial; RHC: right heart catheterisation. EPC: endothelial progenitor cell; eNOS: endothelial nitric oxide synthase; RCT: randomised controlled trial; PAH: pulmonary arterial hypertension; WHO: World Health Organization; FC: functional class; 6MWD: 6-min walk distance; PVR: pulmonary vascular resistance; RV: right ventricle; MRI: magnetic resonance imaging; QoL: quality of life; SF-36: Short Form-36; TTCW: time to clinical worsening. 6MWD: 6-min walk distance; ASK1: apoptosis signal-regulating kinase 1; PVR: pulmonary vascular resistance.